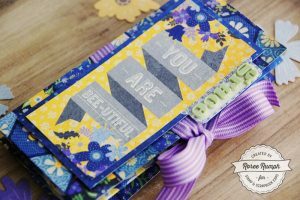 Happy Sunday my crafty friends, and welcome back to Stamp & Scrapbook Expo’s blog. Now that our 2018 show season has come to an end, I’m in serious holiday crafting mode. I absolutely love a handmade holiday and I really enjoy giving handmade gifts and cards whenever possible. I hope the following projects help to inspire you to get started on those holiday gifts. 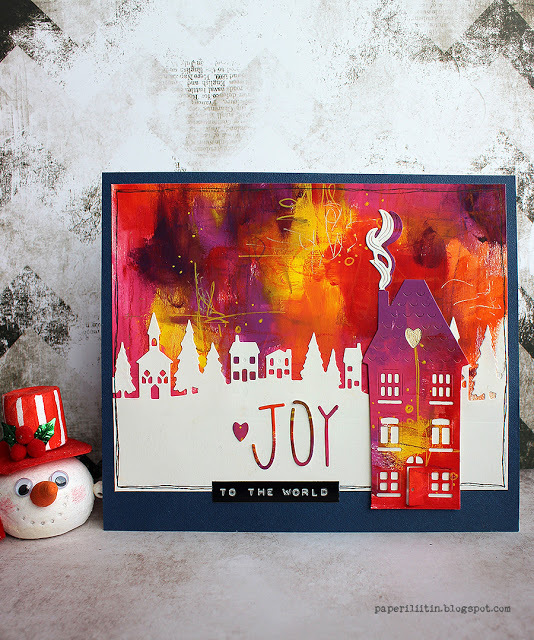 Christmas cards don’t have to be all red and green, as demonstrated by this artsy card designed by the famous Riikka. I was immediately drawn to the gorgeous background and how Riikka die-cut the images out of the same hand-colored paper as the background. There is something to be said for good old-fashioned finger painting, yes, I said finger painting! Riikka used only acrylic paint and her fingers to create the gorgeous colors in the background. 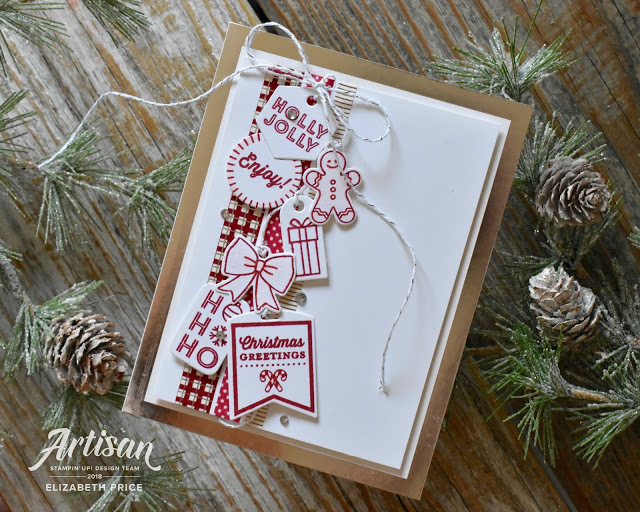 This sweet Christmas card comes together in no time with a little help from your creative friend Elizabeth and the Tags and Tidings Bundle set (item 149986) in the Stampin’ Up catalog. The set comes with 15 tiny tags that help make this adorable card come together in no time. 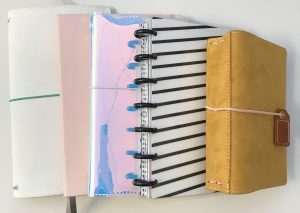 For additional information, click here and I will be happy to take a trip with you to Elizabeth’s blog Seeing Spots so you can take down some notes and order your own Tags and Tidings Bundle set. This set is definitely going to come in handy for your holiday projects. Since the holidays are right around the corner you will most likely be digging for those treasured family recipes that your family loves and expects this time of year. I will be the first to admit that usually I am not a very organized person when it comes to cooking and or baking so this recipe holder really spoke to me and I hope it does to you, too. 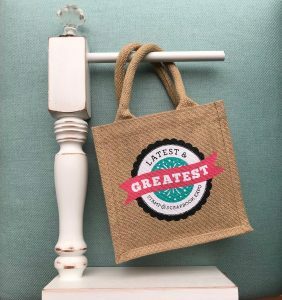 I’m thinking you would be a hero if you made several of these as gifts and included some of your family favorites recipes – you know they are going to ask you for the recipes anyway, right? 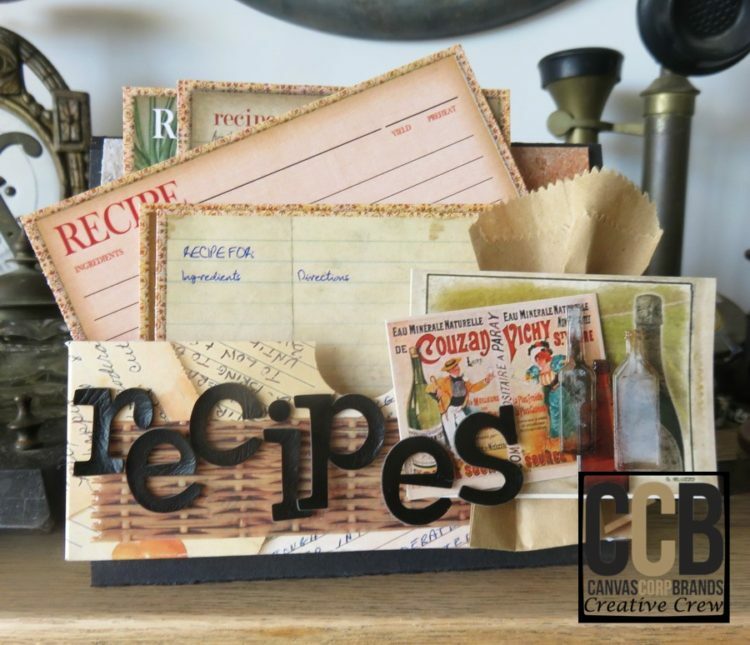 Click here and I will lead the way over to the Canvas Corp blog for complete measurements and products used to create this sweet recipe organizer. 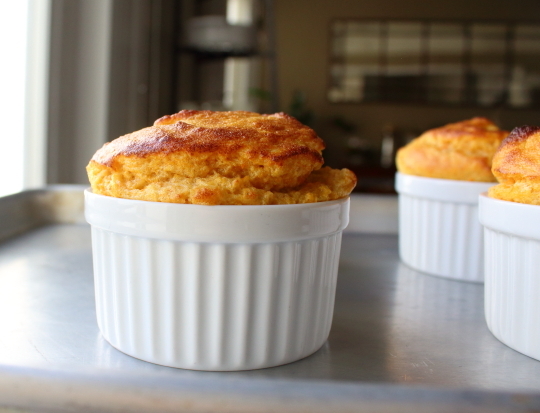 Many people think you have to be a gourmet chef to make a souffle, but that simply isn’t true. With a little help from Chef John and a few simple ingredients, you, too, can pull these off for the upcoming holidays. Click here and I will take you over to the Food Wishes Blog, there is even a short video showing how to prepare these tasty treats. Thanks for the visit and I hope you have an amazing week ahead of you! I’ll be back next Sunday with another session of creative therapy and in the meantime, happy crafting! This entry was posted in At Home, Blog, Card Making, Designers, General Crafts, Manufacturers, New Releases, Organization, Paper Crafts, Scrapbooking, Social Media, Stamp & Scrapbook Expo, Stamping, Stamping Techniques, Sundays With Lorraine and tagged Canvas Corp, Chef John, Christmas card, Elizabeth Price, Food Wishes Blog, Mixed Media, Recipe organizer, Riikka Kovasin, Sweet Potato Soufflés. Fab card, recipe organization and yummy sweet potato recipe!! Thanks for the sweet shout out for my tag card and blog. You are so kind. Hi Lorraine, greetings from San Jose. thanks for recognizing our friend Elizabeth Price in your blog. She has some very inventive idesas. Very creative ! I had not seen this card yet. What fun! Love the recipes holder. Can’t wait to make one. Great time at the show. Hope they give you a larger area next year. Too many of us and not enough chairs.